Abe Sapien digs up more details of his origin, as the biggest secret in ten years of Hellboy comics continues to unravel. 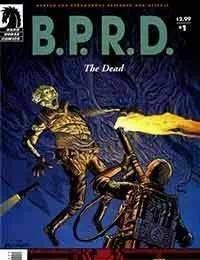 The other members of the Bureau for Paranormal Research and Defense meet their new team leader, a formerly dead Pentagon special operative, as they move in to their new command center to combat the ongoing plague of frogs.<br />While Abe Sapien is looking for information on his past, the B.P.R.D. is relocated to Colorado.<br />After Hellboys departure from the Bureau, Dr. Manning introduces the new Field Team Leader, Ben Daimio, a men mysteriously resurected after a fatal wound.